Racing Hero: Scott Neal - he has already done it all! 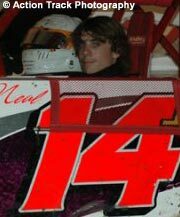 Over 50 A Feature wins in a Kart, won the Spring Maddness in Whitchita, Kansas twice, 1 Track Championship, finished 6th and 7th at the Tulsa Shoot Out in Tulsa, Oklamhoma, 2001 Best Appearing Kart Award. My racing goals would be to keep racing. Get a win in USMTS or a Top 5. Maybe get into a Dirt Late Model.